What's unusual is that 'island' nations do very well. I wonder if it has something to do with those nations being more outdoorsy and thus athletic? The US is below average. Although if you had the information you could redo this for medals gained by where an athlete trains. In that case most the US would move up some. But it's certainly not a great showing. Surprisingly the worst of all is China. Average US is still 5 times more likely to create a medal. It's notably inefficient. Even Ethiopia (not in this chart) scores better than China. I should point out that on this chart the worst is China. The absolute worst is India. Dead last among all nations. 3 medals for 1.2 billion people. They need to get cricket added pronto. I also expect this chart will look pretty different after the Winter games; Jamaica and Cuba are less likely to do well there. Don't give up hope. Bobsled ftw. This made me think about an interesting ceiling factor here. 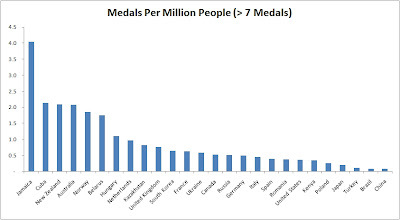 Watching the opening ceremonies and reading this made me wonder how the ratio of Athletes to medals would work out. Turns out it's more complicated than you would originally think. On the high side, a country can only send three to the olympics for a given sport (http://answers.yahoo.com/question/index?qid=20091217173812AAS5a4h) - which leads to an odd effect. If a country is particularly good at a sport, they can ONLY win 3 medals at it regardless of how good they are. As a result, they could have the top 100 people in the world at bobsled, but they only get to send 1-3. On the other side of the coin, countries that are bad a sport, but have a lot of money (think China and the US) may still send someone for a sport, even though they are terrible - such as Biathlon (http://wiki.answers.com/Q/What_Olympic_events_has_the_USA_never_won_a_medal_competing_in). USA still probably sends three, but Grenada sends zero. This tilts the ratio of athletes at a game vs. medal winners in favor of those poor countries, because they just don't send people in which they don't compete. To your direct question, I feel like to some degree the sports that the Olympics host tend to be very specific to a country geography. Norway wins Biathlon because there's a lot of terrain that looks like the Biathlon there. Kenya wins marathons because there's a lot of terrain that looks like a marathon. Some sports are truly artificial (skeleton) and in those cases, it's whether they are "national" sports, but all this babbling still doesn't explain the island effect. I don't believe the Olympic Committee is considering "palm tree climbing" or "Pina Colada drinking" - yet.